Well this is an interesting place. But it seems a bit chilly here. I could really use a find. I don’t have long fur like some other cats. Can anyone help? Find Full Find Chey Rules here. Sorry, Chey…we’re stumped. It kind of looks like the Castle in Hungary, but we’re pretty sure it’s not. No smarty pants in the house. None at all. It figures! We are awake at this uncatly hour for once lately and the picture is so vague we havent got even a clue where to start. OK, now wait… It looks like a pointalism painting of a place. Are you near a painting of a place? Are you lost in an ART MUSEUM? Might as well guess the Louvre! I am not in France, but you know, you might be the closest one so far–or at least as close as Hungary. Are you at a place with the name starting in A-G? Help us find you, Chey! It looks like a castle on the Rhine in Germany but there are so many! We don’t want you to be chilled in some exotic European museum late at night!!! Gee Chey, maybe you should wait inside until you are found. We are not sure yet where you are. Well, we are pretty sure Chey is already inside. That looks like a indoor picture frame ta us. But we have NO idea where “inside” you are. Are you inside dracula’s castle? both have spikey spires. Did you receive the bacon and ham pizza yet? Well we finally remembered to make it here but have no clue where you are. We hope you’re found soon. We don’t know where you are, Chey, but that building looks big enough for you to get lost in for a long time! No idea at ALL< Chey. Looks like you will have a chilly Friday! Do you at least what COUNTRY you are lost in, Chey? Oh dear, you had best keep warm inside somewhere! Ok are you somewhere in Minnesota? Like at an art museum in minne-appo-lis or st. Paul? This is a tough one. My last guess is Belgium. Thanks for the tip, Chey. 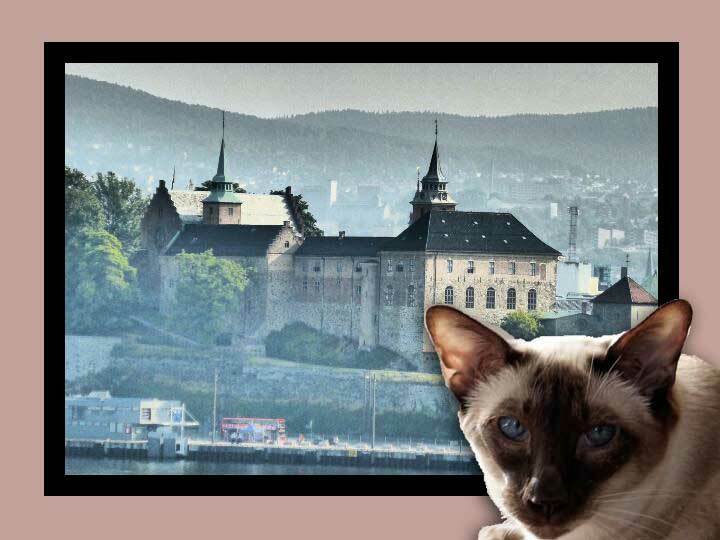 Are you at Akershus Castle in Oslo, Norway? 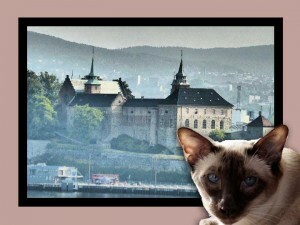 Akershus Fortress in Oslo, Norway? Thats the last time we pick up moms pants off the bathroom floor thinking they were her smarty pants. Concats to the Chans and Cody and Gracie. Glad you were found. Our smarty pants are gone.